Hi crafters! 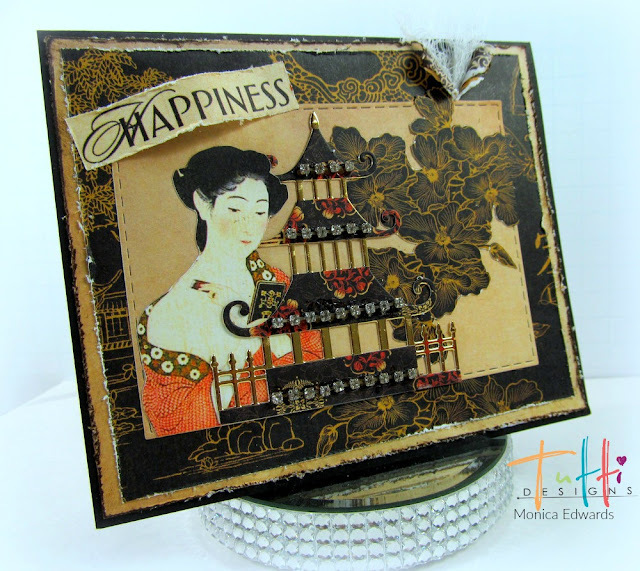 Today is my first post using the dies from the Tutti Designs February release. This collection features dies as I would say from the Orient. You will see a Kimono, a Pagoda TUTTI-276 with Stitched Rectangle TUTTI-217 which I used for my post today along with some papers from the Graphic 45 "Bird Song" collection which could not be a better match right?!! So, I went with a more vintage look. First, I scored some black paper at 5x6.5 then I added a layer of beige cardstock and used hm... not sure what this thing is, but it is like an old fashioned shaving razor, but with sharp teeth it works beautifully at creating a distressed edge to the paper. Then I used some Tim Holtz distress ink in "Walnut Stain" to give it an more distressed look. Then I used another piece of Graphic 45 paper for an additional layer. I tore an opening along the top just for a vintage old fashioned or tattered feel. Then I fussy cut some of the images from the Graphic 45 papers to create the background. I fussy cut a girl from the Orient and places her behind the Pagoda. Then added a sentiment and some rhinestone trim to brighten the pagoda! BEAUTIFUL Monica and yes that paper pack is PERFECT with these new dies in the February release! Great thinking! Love your overall design ... fabulous! Your card is so pretty!! But that pagoda is just a delight and steals the show!! Gorgeously done, Monica!